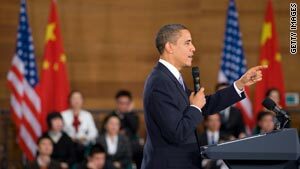 President Obama answers questions during a town hall meeting with future Chinese leaders. Shanghai, China (CNN) -- It was the sound of Springsteen in Shanghai that clinched it for me: This was not your ordinary town hall meeting with President Obama. Don't get me wrong, Bruce Springsteen is usually a staple at Democratic events in America, so I'm used to hearing the strands of songs like "Born to Run" blaring out of speakers at campaign events or health care forums back home. "Sprung from cages out on Highway 9/Chrome wheeled, fuel injected and steppin' out over the line." Strange because the audience this time did not include eager college students in Sarasota, Florida, shouting "Yes we can" in the Democratic presidential primaries. It was subdued Chinese students in Shanghai getting ready for their close-up with the leader of the free world, and they were too nervous to sing along with Springsteen because they were getting their questions ready for Obama. American flags had been carefully placed alongside the distinctive red flags for communist China throughout the small amphitheater in the museum. The presidential podium and teleprompter were all set on the stage awaiting the arrival of Obama, who was still a few minutes away because he was wrapping up lunch nearby with local leaders. So I started chatting up people in the audience, beginning with a 24-year-old female business student working on a Ph.D. who told me she was excited about the possibility that Obama would call on her. She had carefully prepared an economic question and jotted it down on an index card. Her hand was shaking as she showed me the card with a smile: "I'm really nervous." Right behind her was a 22-year-old male student who told me that he and many of his colleagues were trying hard to practice their questions in English because they wanted to "prove themselves" to the international television audience. This male student started telling me how he wanted to ask Obama about why China's higher education system is not doing as well as expected. The student said sincerely, in strong English, that he wanted to know if the president thinks the failures are caused by the education system or if the students should be working harder. It was hardly a question that the Chinese government would want asked, so I was thinking about how interesting it was that these students living under Communist rule were getting a taste of freedom. As if on cue, a Chinese government official stepped between me and the CNN camera to inform me the interview was over and I should move away from the students. I pushed back, but it was clear that pushing on with the interview was going to get the students in trouble. So we moved on temporarily and the town hall started. After the event ended I checked in with the two students. They were both favorably impressed even though neither got called on. The male student said he appreciated the president's humor but also felt that serious subjects were discussed and would help begin a better dialogue between the two countries. "I didn't get a chance, but it's OK," the female student said. "I think it's very good." Meanwhile, Obama was working a rope line and shaking hands with students on his way out the door. Suddenly another female student rushed up to him and recited his campaign mantra from last year. "Yes we can," Obama repeated, turning to aides with an astonished look. "Did you hear that? She said, 'Yes we can." Between that and Springsteen, maybe this was not that different from an Obama town hall event in America after all.